Feeling dreadful to cook elaborately, yet, have no idea what to pack for lunch over the lazy weekend? It has always been my ‘problem’, especially if I already am prepared to cook a lavish dinner meal. I will surely feel reluctant to have to cook for lunch the same day. However, what to eat, what to eat? 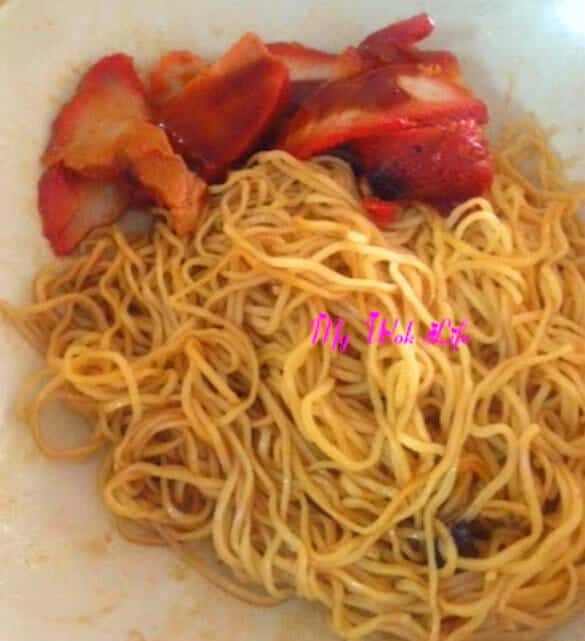 It would be easier, if you are someone who doesn’t mind eating salad, or simply drink some cereal or milk as lunch, but for those who must have staple food for meals…..
Posted similar Wanton Noodle recipe before, I have adapted it for the sauce portion in this dry Char Siu noodle dish, too. 1) Prepare the Char Siu with my recipe posted previously. Or, get the store-bought cooked Char Siu from Chinese roasted meat stalls. Slice it lengthwise and set aside. 2) Bring a pot of water to a boil. Add dried form wanton noodle in the boiling water. When noodle becomes loosen, use chopsticks to stir occasionally while blanching till soften, for about 30 seconds. 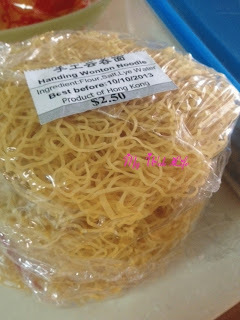 Then, quickly transfer the blanched noodle to a large pot of iced water using a wire strainer, plunge it for 10 seconds. Thereafter, return the noodle to the hot water again for another 30 seconds or so. Remove noodle from pot with the strainer and place on the serving dish filled with the listed condiments. Toss the noodle with condiments till well combined. 3) Arrange generous portion of Char Siu slices on the side and drizzle Char Siu sauce on top of the Char Siu. Serve. A plate of my Char Siu noodle counts about 380kcal. Tips: It is very convenient to get ready-cooked Char Siu meat in Singapore. Not limited to just the roasted meat (food) stall in the hawker centre or coffee shop, it is also available at the roasted meat stall in the wet market, and even minimart. Ask for an amount worth around $3 will be sufficient to make 2 – 3 serving of this Char Siu noodle dish. *Take note, it usually costs more to purchase from the food stall from hawker centre or coffee shop as their main business is to sell as meal, complimenting with the rice or noodle, and not just the meat on its own. * Since the noodle comes in dried form, it needs to be cooked longer than using the fresh soft type. Pick up a strand of the blanced noodle from the cooking pot to test if the texture is ideal to you. Log in to my Facebook Fan Club to check out the details of the store of the recommended wanton noodle.